At the beginning of a new year, 2015, we all have identified the things we want to change to make our lives better. However, identifying the changes is just the first step. Now the hard part begins and that is having the will power and the "stick to it" which is required to actually make the change. The first thing to change is your attitude. Surround yourself with positive people who have high aspirations and a willingness to do the things necessary to reach their goals. Get rid of the negative thinking people...they only hold you back and create doubt in your mind. Next, remember it's never too late to start over. 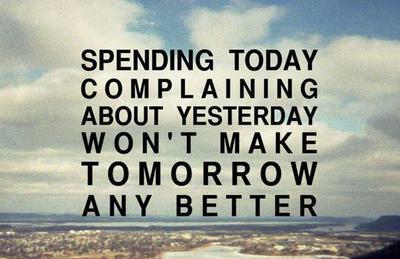 If you weren't happy with yesterday, try something different today. Don't stay stuck. Strive to do better. Lastly, fix your mind on the things that would come as a result of your attitude change and you will have a greater chance of reaching your goal.